What is it about trains? They remind us of a simpler, less harried era, when we had the time to travel at a more leisurely pace. There’s a certain romance to trains as well. The ability to view the unfolding panorama, sitting side-by-side with a travel companion, with time for unhurried conversation. Trains slow us down and we become present in our lives – a very nice place to be while on vacation. Best of all, trains take us to places inaccessible by other modes of transportation. Here are four of my favorite trips. Follow the perilous path of the Klondike gold rush pioneers while riding a narrow-gauge railroad from Skagway, Alaska into the heart of the Yukon. The White Pass & Yukon Route Railroad offers several different route options that take you past glacial rivers, waterfalls, and gorges, giving you an authentic taste of what was wild Alaska. Not for the faint of heart, I took the three-hour excursion to White Pass Summit from Skagway, Alaska, a fully-narrated, forty-mile round trip excursion that climbed from tidewater at Skagway to the Summit of the White Pass - a 2,865 foot elevation. We passed through two tunnels, over sky-high trestles and cascading waterfalls. As we entered Canada and began our turn-around, champagne was served. The railroad recommends the 8:15 a.m. train for best conditions, available daily, for the soft morning light, or the 4:30 p.m. train, which runs Tuesdays and Wednesdays, for the glow of the evening light. There are also fewer passengers on these trains. The Glacier Express is a misnomer as it is a slow ride, allowing passengers to fully experience the breathtaking Swiss Alps through huge panoramic windows. The eight-hour journey connects the alpine village of Zermatt, with stunning views of the Matterhorn, to the resort town of St. Moritz. Along the way you pass the Albula Line with the Solis and Landwasser viaducts and spiral tunnels, the Rhine Gorge, known as the Grand Canyon of Switzerland, and the Oberalp Pass. The train operates year-round with a regular schedule. 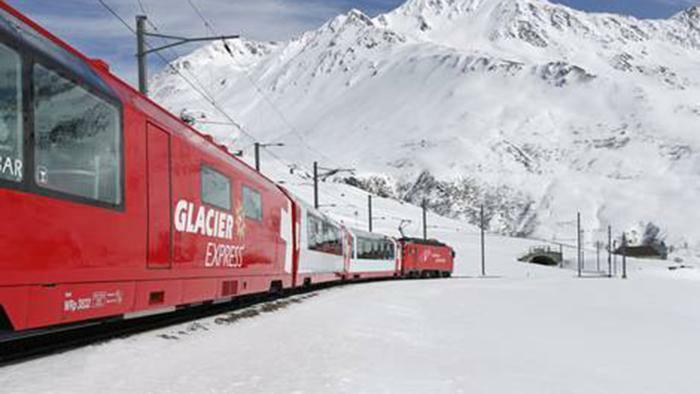 The Glacier Express, a narrow-gauge train, offers two types of tickets: 1st class and 2nd class. Meals, available at additional cost, are freshly prepared on board and served at your seat along with regional wines. On my trip, we packed a picnic lunch. More information can be found here. The Canadian Rockies are spectacular, and the Rocky Mountaineer takes you through majestic areas you can only see by train. Billing itself as a world-class travel experience, it offers four different routes through the Canadian Rockies. You can book a variety of packages that include overnight stays, or you can travel independently and buy one-way tickets. I traveled from Vancouver to Whistler and returned via minivan. Two types of tickets are available: Silver Leaf and Gold Leaf. You’ll get great views, meals, and service on both, but the Gold Leaf is premium. Both services have dome cars with panoramic windows, but the Gold Leaf service has upper-level glass domes. Breakfasts and lunches are included. There are over sixty-five packages to choose from with options, such as: circle routes, starting and ending in the same city, to one way destinations, or adding an Alaskan cruise. Enter your criteria to choose a package that works for you. The Verde Canyon Railroad is a great way to see the unspoiled Verde Canyon and Verde River while seated in a luxurious coach with open-air viewing cars, pulled by vintage diesel engines. Known as a “heritage railroad,” the train boards in Clarkdale, Arizona and travels to the turn-around point in Perkinsville, Arizona. On the return to Clarksdale, shadows and changing light give another perspective to the craggy rock faces. I took the Summer Starlight trip. As darkness set in, we viewed the sky from the open-air car and were amazed by what seemed like a web of stars. With no ambient light, we were treated to a stunning view of the milky way. Summer Starlight trips are offered this year on June 18, July 16, August 20, and September 17, departing at 5:30 p.m. and returning at 9:30 p.m. More information can be found here. Editor's note: The author of this story has no financial interest in the companies, products or services discussed and has accepted no gratuities, payments or free merchandise. Any samples provided for research purposes were returned immediately upon conclusion of the research.